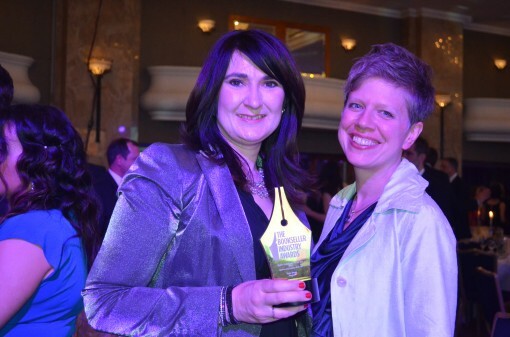 UK “Nibbies” Reach 25: But Why Do Industry Awards Matter? Booskeller MD Nigel Roby took over the “Nibbies” six years ago, though the event dates back a quarter century in all. As the UK’s top publishing industry awards —”The Nibbies” — celebrates 25 years. Roger Tagholm reflects on why such prizes continue to matter so much. Every country with an established book industry should have its own Oscars night, an occasion at which it has an opportunity to honor its own. Just as in-house awards within a company can boost morale and give a sense of purpose, so too such events can engender the same feelings for an entire industry. They give a shot of collective pride, a feeling of acting for the common good, of working towards the same shared goals over and above commercial competition: literacy, education, knowledge, understanding. A sense, let’s say it, that the world is just that little bit better for the business we’re all in. The UK is fortunate to have had such an occasion for 25 years now. This past week’s Bookseller Industry Awards, still known by some as ‘the Nibbies’ after the engraved, bronze, pen-shaped trophies winner receive, was the 25th time the British book trade has come together to celebrate its individuals, its companies and its achievements. The awards began back in 1990 when Amazon was just a river and the discounting of books in the UK was illegal. They were the brainchild of Fred Newman, co-founder of trade paper Publishing News, who wanted to mirror the trade awards that precede the glitzy, consumer side of the Oscars in the US. Or rather, he wanted to bring some of that same glitz to the world of repping and supply chains, to the overlooked nuts and bolts of publishing and bookselling. It was a simple, brilliant idea, one that seems so obvious in retrospect. If it allowed additional advertising revenue to be sought on the back of it, so be it. Newman was nothing if not a shrewd businessman, and everyone knows this is how these things work. The Bookseller Industry Awards today, with its souvenir magazine for guests to take home full of the ‘congratulations to the winners’ pages from sponsors, is no different, and that is fair enough. Indeed, it is interesting to note how these occasions only work if everyone participates, if everyone pulls together. It’s that sense of the industry acting as one again. There was no mention of the 25th anniversary at last Monday night’s event at London’s Hyde Park Hilton, but that is understandable. Publishing News closed in 2008 with the Bookseller taking up the Awards mantle. The magazine rightly regards this as the sixth Bookseller Industry Awards. Yet the fact remains that there have been 25 years of awarding these bronze trophies, 25 years of the British book industry applauding its peers, and that should not pass without being marked. Which is not to suggest any slight by the Bookseller, far from it. Newman died in 2008 and at the Bookseller awards the following year, the magazine’s MD Nigel Roby asked everyone to stand in his honor at the Natural History Museum, in recognition of the fact that Newman was the reason everyone was there. It was an appropriate and touching gesture. Ursula Mackenzie of Little, Brown accepted the Publisher of the Year honor. Last week’s event saw Little, Brown take Publisher of the Year for an impressive fourth time, with Chief Executive Ursula Mackenzie collecting the trophy. It received this accolade in 1995, 2004 (as Time Warner) and 2010. Its victory puts it ahead of Random House, which has won three times (although, strictly speaking, it was Random’s CCV division which won in 2008) and it also makes it noticeable that neither Pan Macmillan nor Simon & Schuster has ever won this honour. However, Pan Mac did win the inaugural Bookseller Special Award for a company or individual that the magazine considers to have been ‘strategically important, or especially innovative’. The publisher received the award for its 15 very successful years publishing Julia Donaldson and Alex Scheffler’s Gruffalo books. There were 22 awards overall and it’s worth noting that five of them were for bookselling. 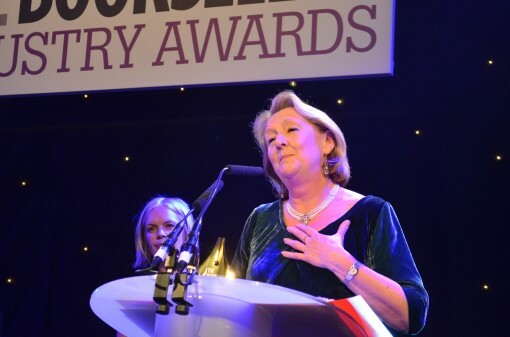 The Bookseller has done much to champion this side of the awards and as bricks and mortar bookselling becomes ever more fragile it is good to see it having such prominence. Blackwell’s was named Book Retailer of the Year and Dulwich Books in south London was Independent Bookseller of the Year. Penguin Random House Chair Dame Gail Rebuck also received the Bookseller’s Association’s Award for Outstanding Contribution to the Book Trade for her work for the Books are my Bag campaign which champions bricks and mortar bookshops. The international side of the industry is represented at the Awards by the Frankfurt Book Fair’s continuing sponsorship of the Rights Professional of the Year, which this year saw two winners – Andrea Joyce of Canongate and Zosia Knopp of Penguin Children’s. Their names were announced by the book fair’s Sales Manager for English Language World, Dorothea Grimberg.